Thanks to President Obama, you can now take selfies in the White House, but we'll have to give thanks to First Lady Michelle Obama for the newly redecorated state dining room. The area, which hosts special events, was last updated in 1998 when Hillary Clinton was our First Lady. The current FLOTUS added her touch to the room by swapping the previous floral drapes for silk window treatments in shades of blue and ecru. 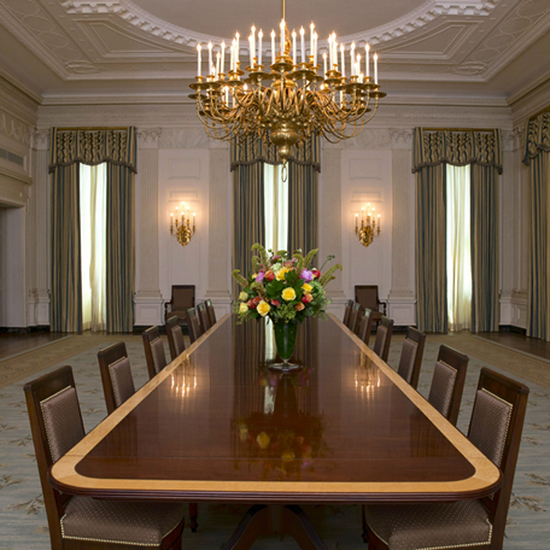 The new window treatments hang from gilded poles and the peacock hues are nods to the waters that surround our President's home state, Hawaii. The subtle makeover also included updated arm and side chairs, which line the massive mahogany dining table. Each seat is custom made and lined with beautiful brass nails. White House Curator, William Allman, stated that the chairs echo ones acquired by President James Monroe in 1818. The $590,000 reno was paid for by the White House Endowment Trust, a private non-profit run by the White House Historical Association to preserve the public areas of 1600 Pennsylvania Avenue. Take a closer look at the makeover in the images below, and if you're decorating on a smaller budget check out our fashion and beauty editor at large's candle obsession.